Yes, another post about the joy of sanding dulcimers. A while back I mentioned possibly making dulcimers without sanding someday. Someone took me up on it! 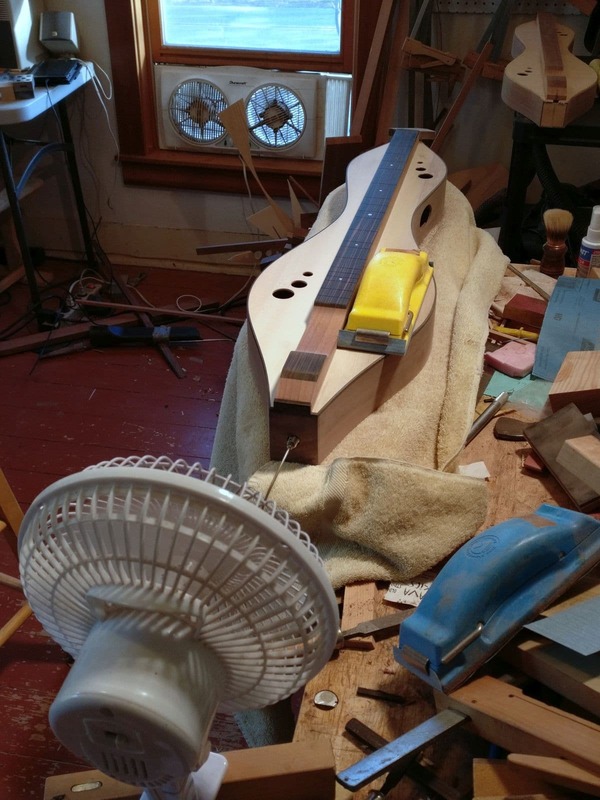 I made a dulcimer with a bare minimum of sanding. Scrapers and files accomplished about 90% of the surface preparation. Sandpaper was still needed to soften some edges, get a good surface on the fingerboard, and to clean up a few small messes. I spent much more time and effort than usual burnishing the wood with cloth before applying the finish. The extensive burnishing combined with using fine abrasive pads while applying the finish produced a result nearly identical to what I carry out by hand sanding. The process took about the same amount of time as hand sanding but it was the first time I had tried this. I am hoping I will gain speed as I become more familiar with new technique. The minimally sanded dulcimer did show a few imperfections and hand tool marks that would have been eliminated by further hand sanding but to my eye and hand they add to the charm of the dulcimer. Still, it is not yet time to abandon lots of sanding on a regular basis. In the photo you can see my warm weather dust cloud elimination system. A small fan blows dust away from the dulcimer (and the dulcimer maker) towards a window fan that blows the dust outside. This simple setup works surprisingly well. During the colder months I replace the window fan with a home-made air-cleaner; a box fan with a furnace filter taped to one side. And I do wear a dust mask! On another topic; after doing some updates on my website something went wrong and about 10 years of photographs have dropped noticeably in quality. Something malfunctioned and over-optimized my photographs. This becomes painfully obvious when you click on an image and see it at a larger size. I figured out how to avoid this on current photographs. It’s just another adventure in being self-employed and learning to do everything myself!